Frederic is a twenty-ish y/o man who is starting his life over again in Bluewater Bay. He’d recently competed in a reality cooking contest program and seemed a favorite to win the big prize, and perhaps the heart of one of the sponsors/judges, Blaire Carruthers, but that all bottomed out when one of the other contestants, Jerry, interfered. He turned Blaire’s head, and got the votes and the guy. The scandal that was close to breaking was settled between Frederic and Blaire’s overbearing, homophobic father for $500K. Frederic used it to pay for a fixer-upper bakery in Bluewater Bay, and goodness knows how many medical bills and IOUs of his alcoholic, ill, homophobic father. Now Frederic works tirelessly at his fledgling bakery to pay the bills and answer further demand for cash from his good-for-nothin’ POS demon-spawn of a dear ol’ dad. He’s startled one day by Blaire’s unexpected and unwanted appearance at the bakery. Blaine, it seems, has had a full change of heart, regarding Jerry, and wants to make amends to Frederic, for abusing his trust and letting him down–by rigging the contest in Jerry’s favor. Frederic wants nothing to do with Blaire–who frankly makes a nuisance of himself by moving to Bluewater Bay and doing a bit of low-level stalking to catch Frederic whenever he’s in need of a little boost. He sees how hard Frederic works, and assumes he needs money, so he arranges a complicated scheme to drum up business for Frederic’s bakery, causing a spiral of near-constant work that has dire consequences for Frederic’s health. Okay, so this book is a good read. Not as upbeat as others in the series. Both guys have a rough family history, even Blaire who’s always had enough money has never had love or approval from his father. Blaire really had affection for Frederic, and hopes against hope that he can get Frederic to give him another chance. Frederic has serious trust issues, but is a forgiveness machine, especially for people who generally do not deserve it. Though, I will admit that Blaire works hard for his approval. He takes care of Frederic, in both genuine and misguided ways, but this is all to the good, for it brings Frederic back…sometimes. This is book low on sexytimes. For the length, there are few (3-4) scenes of lovin’ and many scenes of fighting, not the best mix for me, though some might favor that approach. Also, I struggled a little with the verbiage as there were turns of phrase that more suited the British English–and these are East Coast boys through and through. Most troubling for me, however, was the pace. Again, with so little page time devoted to the romance, the bulk of the story was fighting, illness, and dealing with depressing family problems. I wanted more heat, and less hate. That said, if the book was this long and had 18 smoking hot sexytime scenes, I wouldn’t be frustrated with the slow almost-burn of the plot. This is an enemies-to-lovers plot, but without the incendiary passion that often accompanies those types of stories. Blaire almost immediately went into caretaker mode, and Frederic needed lots of caretaking–so they were more psuedo-enemies in a hurt/comfort scenario. When there was sexytimes there was a hint of kink, a bit of pain for Frederic and a bit of dominance for Blaire. I consider this an HEA. The characters work through their issues and have a definite plan to stay together. It’s definitely a 3.5 star read, but maybe a 4. Interested? 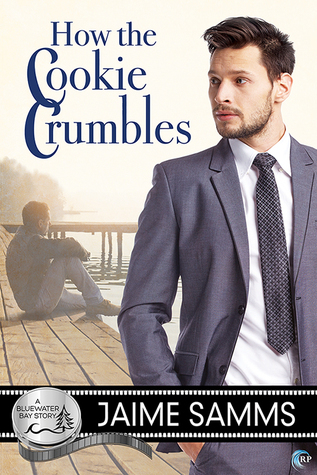 You can find HOW THE COOKIE CRUMBLES on Goodreads, Riptide Books, Amazon, Barnes & Noble and AllRomance. I received a review copy of this book via NetGalley. With most of the hours in the day taken up by a part time job and the full time occupation of raising and schooling two kids, writing is somewhat of an indulgence, but it’s the indulgences that keep us sane, right? When not otherwise occupied, like most writers, reading is my relaxation method of choice, and you can find my reviews at Kuriousity.com and Dark Diva Reviews to let you know what I liked (and occasionally, what I didn’t). And just in case there are an extra few minutes in the day, I also help out the admin team abelong to a writer’s critique group: Dreaming in Ink. After all, idle hands and all that. Catch up with Jaime online here: website | blog | Facebook | twitter.